The bill authorizing the California Highway Patrol to set guidelines for “lanesplitting” has been signed into law. Now it’s up to the cops to decide when and how riders can lanesplit. Kind of funny, since preventing officer discretion from happening is pretty much why the bill was introduced in the first place. From the days of the dinosaurs to 2015, a tacit agreement had existed between the motorcyclists and cops of California: you can ride between lanes of traffic if you’re not a bonehead about it. But last year the CHP took it upon themselves to publish lanesplitting “guidelines” which made its way into state DMV handbooks and websites. 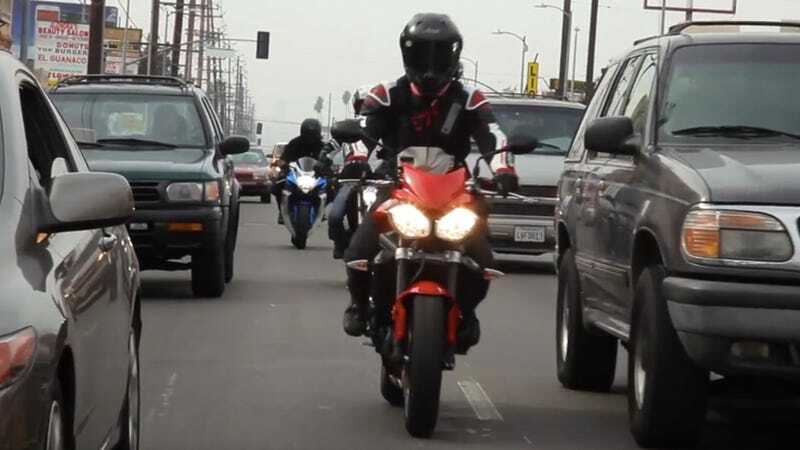 “Lane splitting in a safe and prudent manner is not illegal in the state of California,” the CHP printed before listing out platitudes like “only experienced riders” should do it, according to the LA Times. The controversy was not necessarily about whether or not bikers should be allowed to split lanes, but if the CHP should be allowed to come up with road regulations on their own. The LA Times wrote that California state employee Kenneth Mandler “contended the police agency had exceeded its authority by recommending lane splitting” and so he complained to the state’s Office of Administrative Law, which agreed with him. Motorcycle “enthusiast groups” apparently didn’t like that and shot it down, but went for a new version of the law... saying the CHP could create explicitly guidelines for lanesplitting. Friday, the LA Times reported that Governor Jerry Brown signed that version, and now we’re waiting on the CHP to write the rules about lanesplitting after all. I wonder if the folks who waved off the “15 MPH faster, under 50 MPH” rule will end up getting a better deal. The legislative system works in mysterious ways.